At the foot of Zagros Mountains, where Karun River heads to Khuzestan plain, the most water bank zone of Iran, conquering over the enchanting triangle of "Shush", "Shushtar" and "Chogha Zanbil", the story of importance in ancient era begins. It was Karun, the only river of entire Iran with shipping navigational system that spread mercy onto the island city of Shushtar, in occupation of semi- desert land standing in the way of its stream. It is believed that Darius the Great himself initiated the construction of Shushtar's irrigation system, back unto the 5th century B.C. 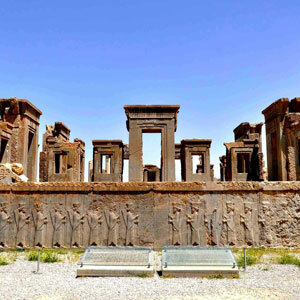 Yet, this masterpiece of engineering was the gem of the later Sassanian Empire, under the reign of one of the most powerful Persian kings, Shapur the great, 1700 years ago. The creative genius of Shushtar hydraulic system bears witness to a rich technical culture that is built to serve the sustainable development compatible with natural and urban environment. Today its efficient operation is the testimony to express its value of diversity usages as civic water supply, mills, farm land irrigation, river transport, and defensive system for unwelcome visitors. Persians created a complex engineering system to optimize the power of Karun river in the cliff of soft rock, building two canals to divert the flow of water, and a network of dams and bridges. 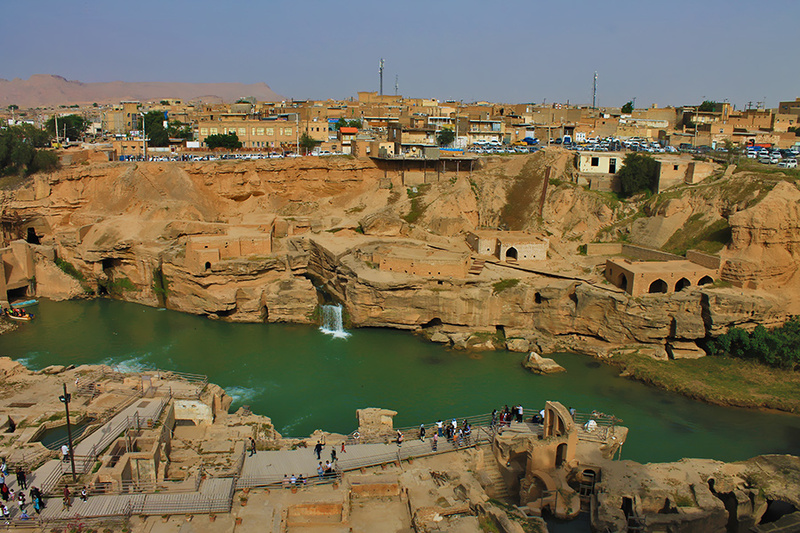 Soon, water rushed to the historical oasis city of Shushtar, in the intricacy of man-made watercourses. With a sophisticated system, it was possible to control the level of water, in order to prevent any damage. Shotit and Gargar branch canals are being separated from Karun at the entrance of city to flow separately into the barrages, tunnels, Qanats, waterfall and mills then rejoin to their mother stream 40 kilometers downstream. The first barrage of Band-e Mizan erected over Gargar and afterward a series of 14 mill, waterfall and dams were constructed. If any section malfunctions, the entire group will be taken down. The Marashi house located at the best point of historical system possesses an enthralling landscape of cliffs that water cascades into the basin. It then pours southern plains and orchards. On the north side of complex there is still the ruins of electric company once built to produce electricity from the power of water as well as the ice factory on west side of area. The utmost economic event of Shushtar hydraulic system relied on trading goods between foreign companies and Shushtar merchants which their invoice and bills are found currently. Ships used to harbor in a little distance of city in the Karun river to load goods. Ingeniously, this water was also used to turn the wheels of about 50 watermills for grinding the wheat of fertile plain of Khuzestan. 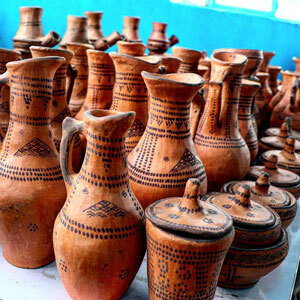 It provided the necessary conditions for the ancient fortress city to prosper as an important agricultural center. In small rocky chambers, people would come to grind wheat, barley, and sesame into flour, surrounded by the sound of rushing waters. Inhabitants also took advantage of the rivers banks, by carving underground rooms to take refuge from the heat during the hot summer days. 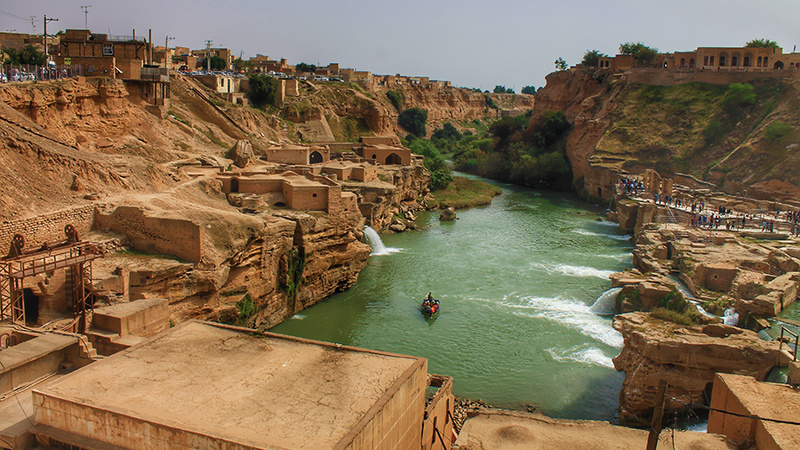 Many world travelers came to admire Shushtar and recall its wonders to the world, such as the French archeologist Jane Dieulafoy, who qualified the site as the biggest industrial complex before the industrial revolution. Six hundred years earlier, it's the Moroccan explorer Ibn Battuta who wrote down its amazement, noting: "On both banks of the river, there are orchards and water-wheels, the river itself is deep and over it, leading to the travelers' gate, there is a bridge upon boats..."
At the shore of Karun river where the branches unit in downstream, a rare and interesting life style can be seen. 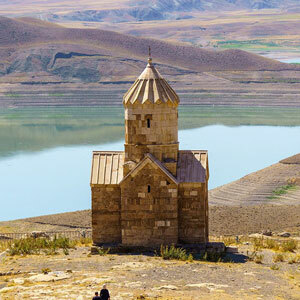 Mandaeans, the small ethnoreligious followers of John the Baptist whose temple is the flowing water of Karun, gather on each Sunday morning to bath in Karun. From generation to generation they have been practicing the profession of goldsmith and truly they are gifted in this field. 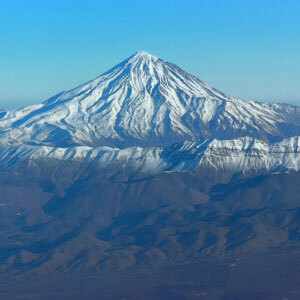 Manda means "Knowledge" in Aramaic dialect. The inventive system is considered as "masterpiece of creative genius" by UNESCO, and can still be observed today working. Blue deep water keeps cascading over ochre rock cliffs, to be poured into a pond by series of stunning waterfalls. Into confined underground chambers, many watermills are still preserved and functional.